By definition, breakthrough innovation is the introduction of new ideas that drive a different way of doing things. This requires risk taking, of course, since no one can foresee the outcome or results of such initiatives. Breakthrough innovators are willing to make decisions and choices as much on the basis of intuition and insight as on data and forecasts – they bet on people rather than manage a process. Another approach enjoying increasingly wide trial is the corporate incubator. Incubators more or less evaporated when the dot-com bubble burst, but BCG research indicates that they are making a comeback – with a twist. The new generation of incubators is focused on incubating ideas that can have a direct impact on the sponsoring company’s business, not just creating stand-alone companies. The start-ups selected for incubation have interactions with their corporate sponsor that go beyond simple cash support, including access to R&D, supply chains, and important customers at both the corporate and the business unit levels. Companies need to develop agile innovation operating models that enable companies to not only test new ideas quickly, but also absorb new capabilities and talent from other industries. Flexibility is especially important, considering how many of today’s innovations have no organizational home. Companies that cling to rigid innovation approaches are more likely to fail at creating space for disruptive innovation or nurturing new ideas. 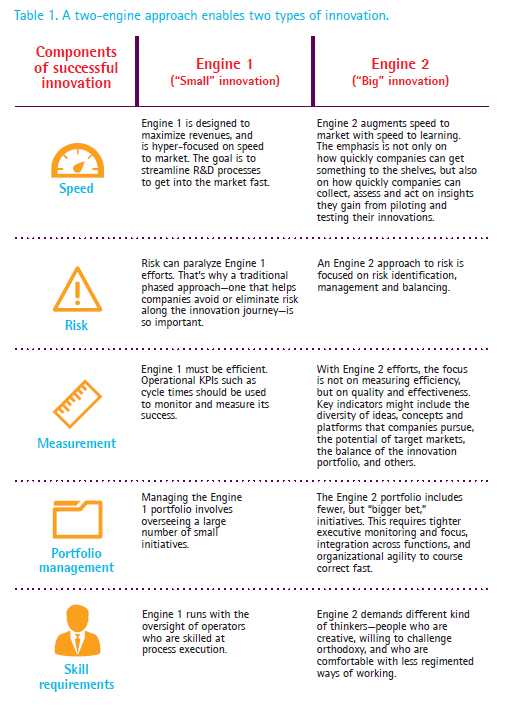 A two-engine operating model holds particular promise for companies looking to achieve flexibility, as well as higher returns from their innovation investments. With this dual model, innovation engine 1 is laser-focused on making existing products and capabilities continually better. Engine 1 supports a company’s steady pace of evolution, and is a critical enabler of the incremental changes that propel a business forward. Innovation engine 2, on the other hand, drives big-bet innovations such as the introduction of entirely new product or service categories, an expansion into new markets, or the development of a new business model. Engine 2 efforts are disruptive and potentially game changing. When executed correctly, these innovations deliver a step-change improvement in organizational performance and competitive advantage. Our experience tells us and substantial research sustains (eg. 2014, Salim Ismail, Exponential Organization) that making new business creation inside a corporation is hard and often doomed to fail. The “immune system” of the core operation is soon to take over any great idea that might cannibalize it and thus even if the right decision is to disrupt yourself from within, it is almost impossible in practice. 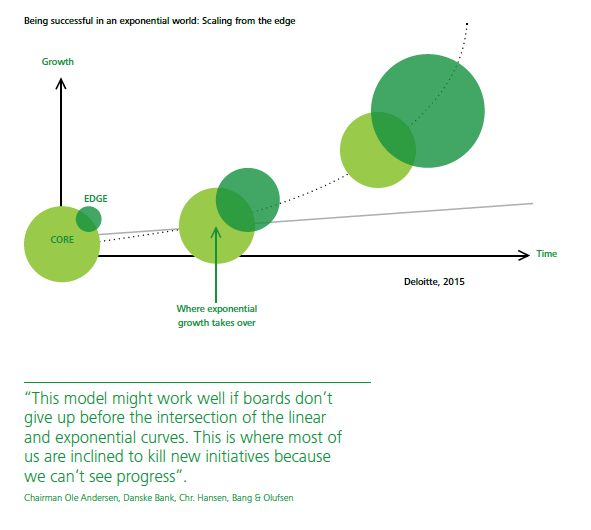 Whereas, it is too early for the relatively sparse sample of global boards having experimented with a Division-X to harvest their fruits we are truly delighted to find that 75% of the companies that report an above 10% growth expectation for the coming 24 months also own a Division-X (or the equivalent hereof). 100% of the surveyed experts agreed that defining an ambidextrous innovation strategy is an important management responsibility and critical to corporate innovation capability. Explorative initiatives and strategies should be pursued in dedicated units, decoupled from core business. 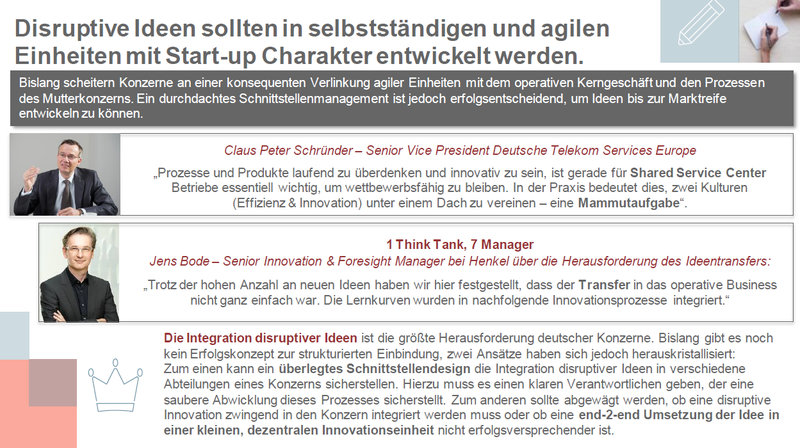 The integration of disruptive ideas is the biggest challenge in german corporations. How can interfaces between dedicated units and core business be properly designed in order to develop disruptive ideas up to commercialization? Accenture’s recommendation, the two engine solution, is appropriate but not new. Their suggestion is to define a path for incremental ideas, and a separate methodology and philosophy for radical or disruptive ideas. In this manner the ideas would be treated differently. What’s missing is a portfolio approach, which would indicate how many ideas of each type are valuable or necessary. (…) But until there’s clear sponsorship for disruptive ideas, funding and risk tolerance for those ideas and clear metrics and measurements, all ideas will eventually become incremental. We need to move beyond the myth of the ‘ambidextrous’ organization – large companies need to work on transformative innovation both internally and through engagement with the startup ecosystem. Learn to embrace disruption through collaboration. In the past, systematic dual innovation management approaches have often been discounted due to falling short of expectations or lacking prevalence across the sum of companies. Both reasons, however, don’t necessarily imply the basic concept is inappropriate or even wrong. Adequate buy-in on part of executive/senior management and proper implementation of these approaches are mandatory prerequisites in order to make them live up to their potential and – as a consequence – increasingly trusted and applied. The above studies clearly reveal: Organizational ambidexterity proves to be a necessary condition for outstanding corporate innovation capability. Company boards may ignore it at their peril. In a following post, I will be attempting to introduce a model for modern, dual innovation management. Let’s start working on the question: How can we get essential organizational ambidexterity from myth to going? Hi Ralph – a very good article. It’s also worth highlighting the difference in the expectations of both success and risk with senior management. They will usually have long experience and deep intuition about innovating with the core. They will have a good idea what will work and what won’t. When it comes to completely new opportunities, they need to approach it with a different mindset; one that will accept a lower success rate and higher risk, but that is worth pursuing for those initiatives that work. First, dedicated leaders/senior managers – a different breed than daily business managers – need to get selected and developed in order to properly pursue exploratory purposes. Second, leaders at the very top – such as board members – are inevitably required to exhibit an ambidextrous mindset in order to bridge exploration and core business successfully. A necessary condition for organizations to flourish sustainably.